Q: What is this new diploma? Geetu: We believe that knowledge should never discriminate, and that is why we designed CIMA’s very first Global Diploma in Performance Management for working professionals of all backgrounds to learn how Management Accounting can help support crucial decision-making in all business functions. Even without a financial background, you will definitely benefit greatly from learning how to plan, manage and control cost to execute short-term decision-making efficiently in a specific business context. This shapes the foundation to facilitate long-term risk management through the implementation of a desired performance strategy to give your organisation the edge it needs. You are only two exams away in taking your organisation’s performance to the next level. This Diploma in Performance Management covers short term cost management and long term performance strategy. Q: Why should one complete this diploma whilst there are MBAs and other such professional qualifications available to them? Geetu: This diploma is catered specially for working professionals who could also be already possessing a different qualification. A CIMA qualification will always add value to those who have differing professional qualifications as this shows that you possess financial and business acumen. If you wish to migrate, this would work perfectly for you as CIMA membership is accredited amongst leading professional accountancy bodies paving you a quicker pathway. Over 1500 Sri Lankan CIMA members have benefited from such pathways, having migrated to countries like Australia, South Africa, United Kingdom, etc. having only CIMA as a professional qualification. CIMA is truly a global passport. With the Association of International Certified Professional Accountants (the Association), which is the most influential body of professional accountants, created combining the strengths of the American Institute of CPAs (AICPA) and the Chartered Institute of Management Accountants (CIMA), those with CIMA certifications and qualification demand greater recognition across the world. The Association represents 667,000 members and students in public and management accounting and advocates for the public interest and business sustainability on current and emerging issues. With broad reach, rigor and resources, the Association advances the reputation, employability and quality of CPAs, CGMA designation holders and accounting and finance professionals globally. Q: As the first Sri Lankan on the global board of a multi-disciplinary professional services firm how important do you see this diploma? Reyaz: As the Chairman of KPMG Middle East South Asia Division, I see and meet various professionals qualified and experienced in different disciplines. Many still struggle when it comes to contemporary costing techniques, strategic analysis, etc. I feel these professionals would benefit from an intense training in Management Accounting which this diploma provides and the qualification, which is highly recognised globally, would give them an added advantage. Further, in the future, organisations would expect all employees to be multidisciplinary and this is an ideal qualification which would give any participant an advantage in the career market. Q: What does KPMG bring to this qualification? Reyaz: We at KPMG believe in quality, trust and reliability which has been our governing principles in Sri Lanka for over 100 years. We were delighted to associate ourselves with the Diploma in Performance Management as we felt that it fulfilled a critical need for upskilling non finance professionals with Management Accounting skills. We will also provide industry input to the program drawing from our wide and varied industry knowledge gained over the years. Q: CIMA is a global giant in professional education. Why would there be a need for a combined co-branded qualification? Geetu: This program has been curated to bring in the best of both worlds to those who aspire to be ahead of business. You get the CIMA course content as well as industry expertise from KPMG, a leading professional services firm. We want to provide participants with much more than course content, we want them to see the practical side of business. 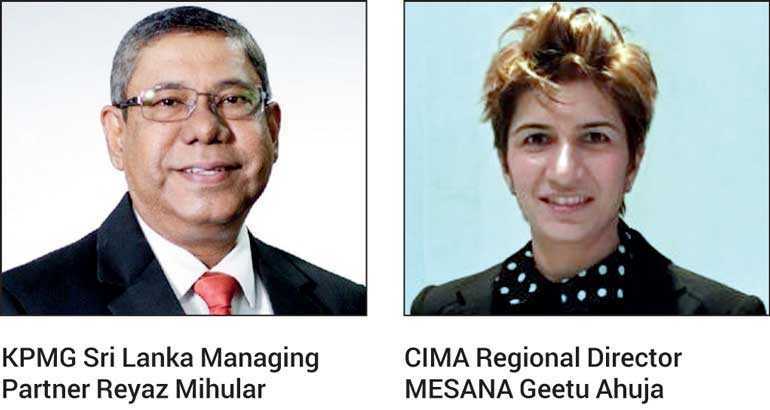 There are six interesting sections covered by the KPMG experts and they along with Wisdom Business Academy, the largest CIMA tutor in Sri Lanka and CIMA Sri Lanka have built a comprehensive workshop/program focusing on quality knowledge dissemination. Q: Once this is completed, can participants proceed further with the CIMA qualification? Geetu: Today’s world is all about lifelong learning. With the rapid technological change we experience around us, much changes take place at a pace than we can handle. Hence, we believe in assisting these professionals to enhance their careers further. Thus, on completion of the Diploma (including the two assessments), they can apply to proceed with the prestigious CIMA professional qualification. All applications are subject to a rigorous review of work experience. If approved, they can proceed directly to the Management Level Case Study examination. An entry fee for this pathway will be charged, however. Q: Who would benefit from this program? Reyaz: Industry leaders as well as professionals in Law, IT, Engineering and Marketing who have experience in General Management would benefit from the Diploma in Performance Management which can serve as an added qualification and would even launch them in their journey to obtain the CIMA qualification and thus the CGMA designation if preferred. Q: How soon can one complete this diploma? Geetu: This can be completed within four to six months depending on your pace. Once the workshops are completed, you can proceed with the assessments. All participants will be provided assistance throughout their journey with not just the classroom sessions but also online Learning Management Systems provided courtesy of our delivery partner Wisdom Business Academy. Q: Has this program been conducted anywhere else? Geetu: CIMA’s Diploma in Performance Management program is conducted successfully in Europe. The program’s success has been measured through high volumes of candidates achieving the prestigious certification towards their career advantage. Q: What will you get at the end of the program? Geetu: On successful completion of the program including passing of the two assessments, candidates will be awarded the prestigious certification – Diploma in Performance Management, powered by CIMA and KPMG.